The main focus for most business types are the top Social accounts where most people tend to hang out and chat to friends, family, business associates and colleagues, and indeed local businesses with whom they deal with or visit on a regular basis. For Larger Businesses it is now common practice for them to ask you for your e-mail address and phone number at the check-out so that they can contact you shortly after your purchase to invite you to join their Facebook group or other social media group. We find that many local businesses don’t ask these simple questions and are missing out on a major source of new or repeat business. Here at Habazar Internet Marketing our team will help you to set this in motion and then help you to grow your social groups with regular interactions on your behalf and encourage you to get in to the habit of connecting with your social media crowd. Social Media is becoming more and more important as people nowadays are connected in so many ways, mobile phones, tablets, and computers which are then connected to Apps which they download from Google Play, I-Store, Amazon and many other App centres. CONNECT WITH YOUR PROSPECTS NOW !! Facebook is probably the most popular social group where all age groups tend to hang out. All ages are catered for with public and private chat available for individuals and also for Private Closed groups and Businesses of kinds now have Substantial Facebook profiles and Business Pages. If you want to connect you MUST have a Facebook presence. Twitter is a useful Social media account for post quick snippets of information or special offers to your Social crowd. People read twitter post as they are short & fast messages that readers know can be read quickly whilst on the move or at work. Currently one of the fastest growing Social Media accounts. User engagement is high on mobile phones so it is essential to start using this in your social media arsenal. Again it popular because it is fast and can be read on the move ans is an ideal way for businesses to send out instant special offers or deals of the day etc. Simple and effective engagement. LinkedIn is ideal for business people and Business to Business Social engagement. You can connect with like-minded people or form groups for your own business to engage with colleges or clients. If you are in Business then you should be connected to LinkedIn as part of your overall business strategy. 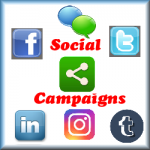 The Social Media Basic package will drive awareness, calls, and foot traffic for local businesses that have a physical office or is Area-specific. It focuses on sophisticated targeting, high-quality creatives, and turnkey social media service to propel results and provide ROI for the business. Click Here to Start Today !